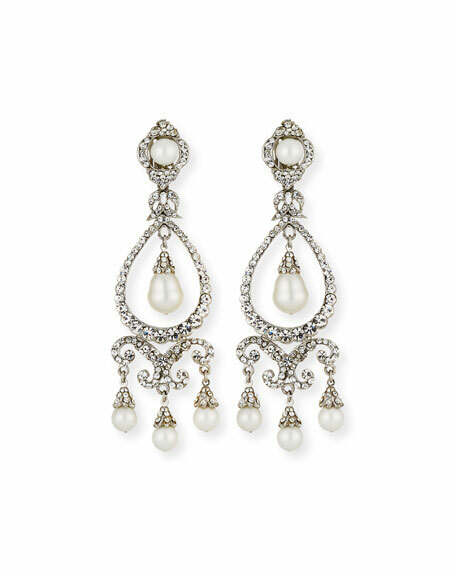 Jose & Maria Barrera chandelier earrings. 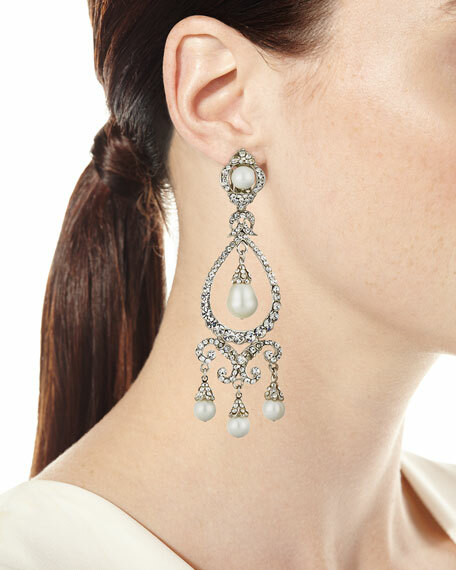 Alexis Bittar crystal lace chandelier earrings. 10-karat gold and rhodium-tone hardware. Hand-sculpted, hand-painted Lucite??. Swarovski?? crystal accent dangles. French wire for pierced ears. Approx. 1.6"L drop. Clover crystal dangle earrings by Dannijo. Silvertone plated hardware and settings. Mixed-cut, prong-set Swarovski?? crystals. Approx. 3.5"L drop; 2.5"W. Clip-on backs. Imported. EXCLUSIVELY AT NEIMAN MARCUS Jose & Maria Barrera abalone disc chandelier earrings. Signature 24-karat gold plated hardware and backs. Austrian crystals and glass beads with abalone discs. Approx. 3.8"L drop; 2"W. Clip-on backs. Made in USA. Jose & Maria Barrera floral decoupage drop earrings. Polished 24-karat yellow gold-plated hardware. Round posts with round decoupage drops. Round turquoise stone accents and halo. Clip-on backs.